More and more people in Lawrence, Massachusetts, are getting the troubling news that space heaters are not safe options for their homes in the two months they will spend without gas heating after the Merrimack Valley explosions. Despite an effort to distribute 24,000 free space heaters across Merrimack Valley, most families who were left without heat in the wake of the Sept. 13 gas explosions still don't have them, an issue that officials blame on the old housing stock in Lawrence, Massachusetts. 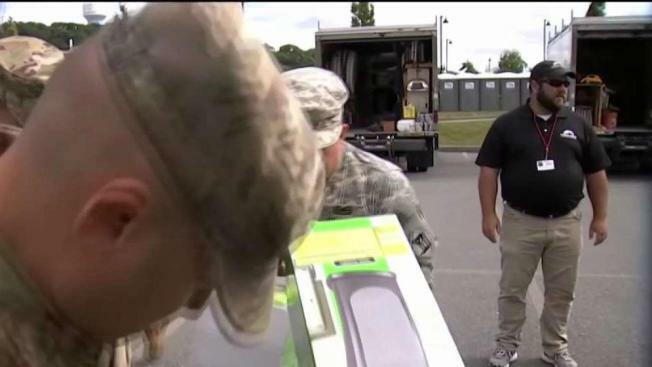 The heaters, which have been distributed by the National Guard since Monday, are only given to homes after safety inspections. "It's really cold," said Tere Santos, whose home failed an inspection. "I got mad because I was expecting to get one or two." Lawrence Fire Chief Brian Moriarty said Friday that only 10 out of every 100 homes inspected this week received space heaters. He said many homes in the city don't have the required 20-amp circuits. "This is an old mill city built back when the mills were in their heyday," he said. "The triple deckers and the homes in the city were built for the employees that worked back there. It's in the range of 100 years old." Columbia Gas said it will work on a case-by-case basis with families who didn't receive space heaters. The options include complimentary hotel accommodations.